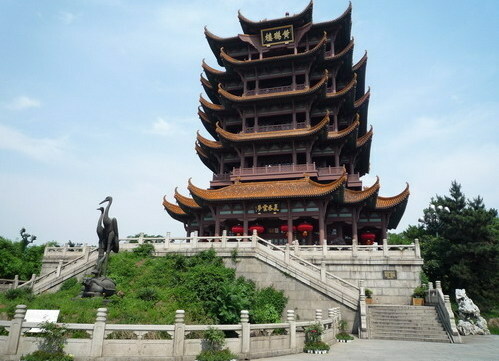 If you’re in Wuhan, an absolute must-see is the Yellow Crane Tower. Regarded as one of the Four Great Towers of China, the tower stands on the banks of the Yangtze River at the top of Snake Hill. It is incredibly beautiful and its cultural significance led to its being made the symbol of Wuhan city. It goes without saying that it is one of Hubei's most popular tourist attractions. According to legend, Yellow Crane Tower was built by the family of an old pothouse owner living in Wuhan city long ago, named Old Xin. One day, a shabbily dressed Taoist priest came to the pothouse and asked for some wine. Old Xin paid no attention to him, but his son was very kind and gave the Taoist some wine without asking for money. The Taoist priest visited the pothouse regularly for half a year when one day the Taoist said to the son that in order to repay his kindness, he would like to draw a crane on the wall of the pothouse, which would dance at his request. When people in the city heard of this, they flocked to the pothouse to see the dancing crane. The Xin family soon became rich and they built the Yellow Crane Tower as a symbol of gratitude to the Taoist priest. The tower that stands today is not the original building; it has a very long and complicated history. It was first built in 223, during the Three Kingdoms Period (220 - 280). Due to the ideal location, it was built by Sun Quan (182 - 252, King of Wu) as a watchtower for his army. After hundreds of years, its military function was gradually forgotten and the tower was enjoyed mainly as a picturesque location. During the Tang Dynasty (618 - 907), many popular poems were written in praise of the Yellow Crane Tower. It was these poems that made the Tower so renowned and induced for people to visit. During the following centuries, it was destroyed and rebuilt several times. During the Ming (1368 - 1644) and Qing (1644 - 1911) Dynasties alone the tower was destroyed seven times and rebuilt seven times. In 1884, it was completely destroyed in a fire and was not rebuilt until 1981. The tower had different architectural features in different dynasties. 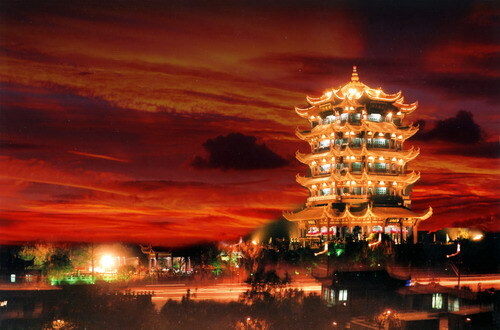 However the tower which stands today is based on the one designed during the Qing Dynasty. It stands 51.4 meters (about 168 feet) high and has five floors. The appearance of the tower is the same regardless of the direction it is viewed from. The roof is covered by 100,000 yellow glazed tiles. With yellow upturned eaves, each floor seems to have been designed to resemble a yellow crane spreading its wings to fly. Around the main tower there are many other buildings, including the Sheng Xiang Pagoda and the temple gate. Each storey is decorated with traditional upturned eaves, but each one has a different style. The ground floor is a tall, wide hall. The midmost caisson ceiling stands over 10 meters high. On the front wall is a huge ceramic mural painting of a white cloud and a yellow crane. A pair of 7-meter-long inscribed tablets hang on the posts on both sides. The front wall of the second floor holds a marble inscription of Tang Dynasty poet Yan Baojin’s ‘Note on the Yellow Crane Tower’. On each side of it are mural paintings. One is ‘The Town that Sun Quan Built’. It describes the history of the Yellow Crane Tower and Wuchang town. The other is ‘Zhou Yu Made a Feast’, which tells the story of the Three Kingdoms celebrity’s visit to the tower. Throughout history, poets, writers and artists have travelled to the tower for inspiration, including Cui Hao, Li Bai, Bai Juyi, Yang Shen and Zhang Juzheng. Cui Hao’s famous poem about the tower is said to be one of the greatest works in the Chinese poetic canon.